In his room in New York, a young Japanese man awakens from a nightmare filled with samurai warriors and a strange symbol. 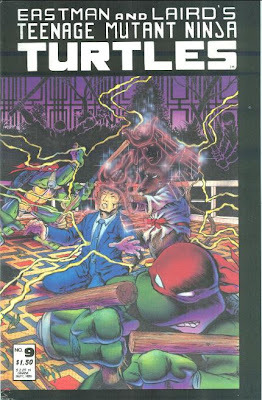 Elsewhere, in the sewers, Splinter trains his four pre-teen Ninja Turtles: Leonardo on the katana, Donatello on the bo staff, Michelangelo on the manriki-gussari and Raphael on the tonfa. With lessons completed, Splinter goes to meditate. He feels a presence attempting to contact him from across the astral plane. The next day, Splinter gives his sons the afternoon off while he searches for the presence. His searching leads him to a dying old man in Japan named Gosei Hatsumi. He is the avatar of a mystical warrior power called the Gosei Spirit that has been passed from father to son for centuries. Alas, his son, Gosei Kenji, has created a criminal empire in New York and become unworthy of the Spirit. Only his grandson, Gosei Hattori may be worthy of the legacy, though Hatsumi is dying and the opportunity to transfer the Spirit grows short. He asks Splinter if they may switch bodies for the next ten hours so that Hatsumi may save Hattori from the criminal life of his father. Splinter agrees without hesitation, even though if Hatsumi’s body dies with his soul in it, Splinter will perish as well. Having access to Splinter’s memories, Hatsumi immediately rallies the Ninja Turtles for a secret mission to Goseico. They infiltrate the top floor penthouse of the massive skyscraper and find Kenji and Hattori preparing for dinner in the garden. Hatsumi orders Leo to stay with him while his brothers perform reconnaissance. Searching the office area, Don and Raph overhear a pair of corporate go-getters, Takahashi and Iwata, discussing their plans to assassinate Kenji and Hattori during their dinner (and thus inheriting the company and criminal empire for themselves). Don and Raph return to Hatsumi with the news and he dispatches them to find and kill the assassins. As the Turtles take out a quartet of Foot Soldiers, Kenji and Hattori enjoy their dinner. Kenji has big plans for his son within his empire, though Hattori is more interested in continuing his studies after college and pursuing the old ways of his family. Unfortunately, the Turtles miss one of the Foot Soldiers, who comes at the Goseis with a gun. Kenji shields Hattori from the bullets as Leo takes the Foot Soldier out, but the wounds prove instantly fatal. Hatsumi approaches Hattori, who is reluctant to believe that the old rat is his grandfather. Hatsumi then draws a strange symbol in the dirt; the symbol of the Gosei Clan. Hattori recognizes it from his nightmares and believes Hatsumi’s words. As the Turtles guard the exits, Hatsumi transfers the Gosei Spirit to Hattori. 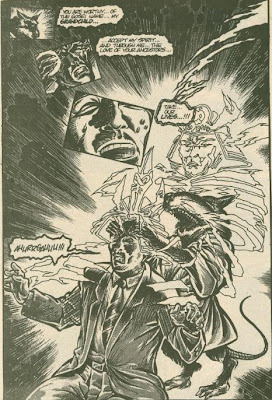 He finishes just in the nick of time, as Hatsumi’s body dies and Splinter returns to his proper place at the last second. Suddenly, a fifth Foot Soldier drops through the skylight and attacks. Using the Gosei Spirit, Hattori defends himself and kills the highly trained assassin. Hattori thanks Splinter for all he has done, though Splinter reminds him that what he does with his family’s legacy is his choice, and may he choose well. Standing over his father’s dead body, Hattori considers those words. 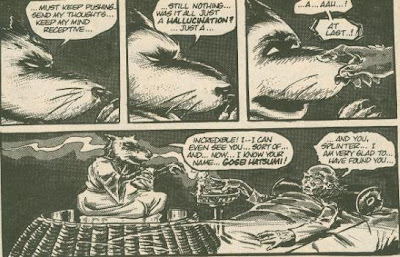 Traveling home across the rooftops, Splinter tells the story of what was really going on to his clueless sons, who thought that he had just been acting strangely for the past few hours. 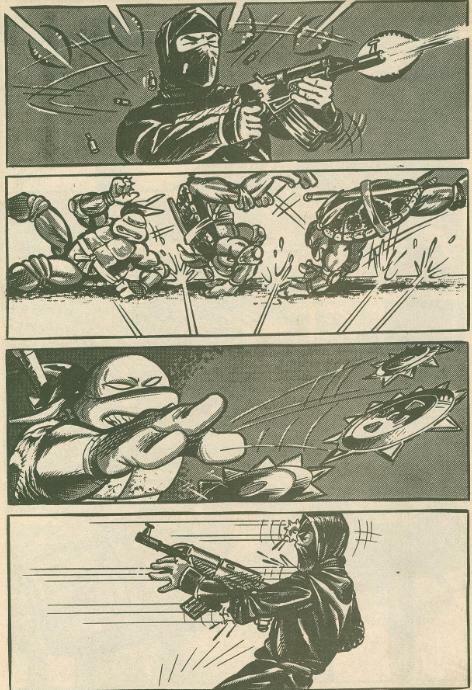 *“The Passing” takes place before TMNT (Vol. 1) #1, when the Turtles were still pre-teens. 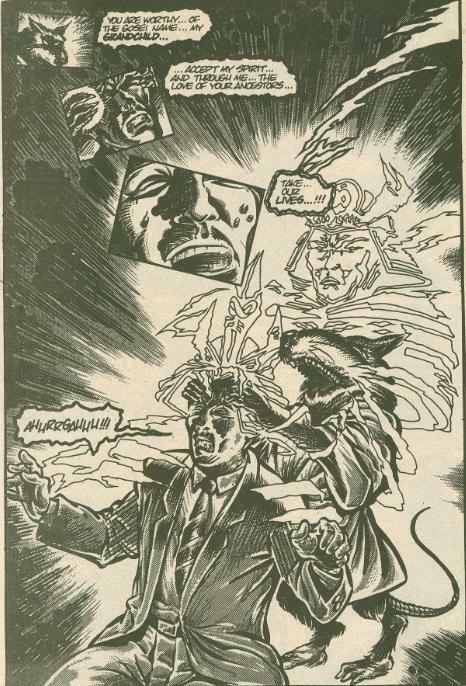 *How Splinter learned to astral project will be revealed in Tales of the TMNT (Vol. 2) #2. *Hattori will meet the Turtles again in TMNT (Vol. 1) #46. *Hattori will reclaim Goseico, and Takahashi and Iwata will get their long-overdue just desserts, in Tales of the TMNT (Vol. 2) #22. *The leadership of Goseico under Foot control will be detailed in TMNT (Vol. 3) #24. *This issue also contained an excerpt of “Rip in Time” by Richard Corben and Bruce Jones and a bonus pin-up of Raphael and Gizmo Sprocket by Michael Dooney. *CHET ALERT: Page 3, there is a restaurant named “Chet’s”. The name “Chet” was an in-joke inserted into several TMNT comics by the Mirage staff because… they just liked that name! Here we have the first pre-Teen Turtle story of the series, and get ready, because there’ll be plenty more. However, unlike the 4Kids cartoon, whose pre-Teen Turtle episodes were almost routinely the worst output of the entire series, the pre-Teen Turtle issues of TMNT were usually a welcome and fun diversion (in fact, most of them are just shorts, with only a few being full-length issues). “The Passing” shows us a side of the Turtles’ upbringing that a lot of later issues tend to overlook: that Splinter trained them from birth to be assassins. Splinter was their father and he loved them, yes, but he raised them with the singular purpose of killing the Shredder and avenging Hamato Yoshi. While most pre-Teen Turtle stories simply show him training them in the martial arts like kids at tai kwan practice at the mall, this story shows that before they’d even hit 13, they were already straight-up murdering Foot Soldiers and not giving a damn about it (their nonchalant attitude toward killing in this story makes it expressly clear this wasn’t their first time). So with that in mind, “The Passing” is rather dark in comparison to other pre-Teen Turtle stories, or at least paints their youth with a less jovial brush. I mean, hey, if you’re going to raise a quartet of kids for the sole purpose of murdering your arch rival, they have to start somewhere, right? 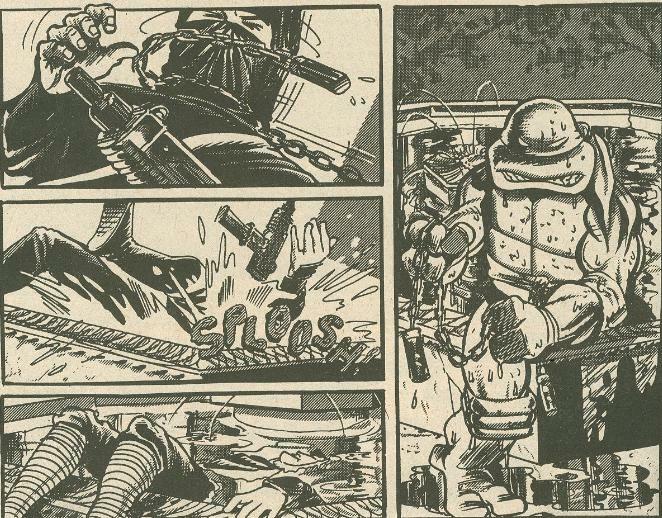 There are a lot of nice touches in this issue, though, particularly in the weapons the Turtles use. Mike is shown wielding a manriki-gussari and whining about wanting to use nunchakus; a nice moment showing that he had to work his way up to the weapon. Raph’s tonfa are given less of a focus, but still, I’m always thrilled to see the Turtles using weapons other than their mandatory action figure accessories. And dark though their childhood may be, Mike still goofs off and Splinter still scolds him, adding at least a little bit of levity. There’s at least something of a “father/son” dynamic present here and not exclusively a “master/student” relationship. As for Hattori, he’s a character I’d like to have seen more of but wound up being a bit squandered in the Mirage series. He’d make three more appearances between this volume and Tales of the TMNT, all of which were good stories, and definitely had the potential to be a strong recurring character. His history with the Turtles runs deep and his familial legacy runs even deeper, offering quite a bit to work with. The Mirage series was very unfocused for a great length of time and the potential to develop a cast of recurring characters wound up flying out the window. Characters like Hattori, Nobody and Radical only amounted to a handful of guest appearances when they could have been used to much greater effect. As much as I like Casey Jones, there should be more humans involved in the Turtles’ adventures than just him. Anyway, as another “milestone”, TMNT #9 is the first issue of the series to see the art delegated by Eastman and Laird to somebody else; in this case, the immensely talented Michael Dooney. The Mirage crew as we recognize them was still growing at this early point in the TMNT franchise, with this also being the big introduction of Jim Lawson and Ryan Brown; two more mainstays of the Mirage crew, joining up with the already attached Steve Lavigne. The opening editorial from Laird welcomes these “newcomers”, whom by now we all recognize as Old Guard, which ought to give you a good impression of how early in Mirage’s infancy this is. Dooney’s style is definitely different from how we recognize it today; looking very much like it’s trying to copy the visual flavor of Eastman and Laird. I get the impression that was an intentional maneuver on Dooney’s part, so as not to disturb the artistic flow of the series for the readers. The bonus pin-up included in the issue is very much in Dooney’s standard style (albeit with a bigger beak on Raph than usual), so that’s one of the other reasons why I was left with such an impression. I think Dooney shines brightest in the decompressed, silent action sequences as the Turtles deal with the Foot Soldiers. 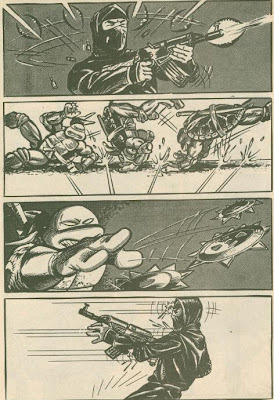 The pages where Mikey drowns a Foot Soldier in a fountain and when Leo takes out one with a shuriken are definitely my favorites. I suppose if this story suffers anywhere, it’s that it doesn’t necessarily have to be a pre-Teen Turtle story. Their age isn’t really a factor in anything significant and the Turtles hardly speak or put their personalities on display at all. It’s much more of a Splinter story, even if he spends the bulk of it on a deathbed, and the Turtles are just along for the ride. Hattori isn’t a character everyone cares about and if you don’t like him then I can see why “The Passing” wouldn’t appeal to you. Though as a pre-Teen Turtle story, it shows a darker dimension to their upbringing more in-tune with Splinter’s speech from TMNT (Vol. 1) #1, describing their grim purpose in life. So for that reason, it’s definitely one of the best issues covering that era.